A retired couple demanded a new way of living. After sending their 4th child off to school, they needed a smaller more efficient house, but more importantly a new way of living. The first requirement was to create a space of overlaps and connectivity. 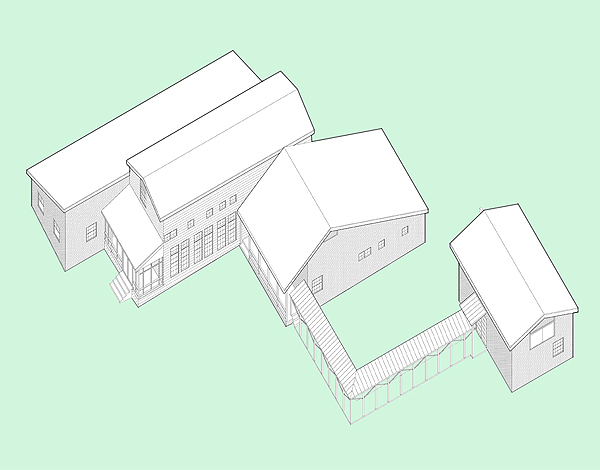 The American Barn proved ideal for both form and space. Under one roof a barn creates multiple, hierarchical, clear organizations and functional overlaps. The Mayes County House is perceived as a central barn flanked with side "stalls". one for sleeping, one for storage. The Loft space serves as the main living environment. All peripheral rooms open directly onto this space. Domestic scaled spaces (storage, entry, porch, mud-room, etc.) occur as the side stalls shift beside the loft barn. This shifting also allows for connectivity of views, indoor and outdoor. From the main loft space one is always engaged with other activities in the house, and in certain views allow one to occupy a side stall and see through the loft barn to the outside and back into the opposite stalls. Shifting volumes reach out to engage the landscape creating outdoor occupation. One side becomes a privacy wall, the other, a series of intimate gardens. Porches serve as the transitional thresholds.